Found this on ebay. There are some games, notably Tron, that just have to have a trigger grip or three hands. One for spinner, one for joystick, one to fire. I also think the joystick is a slick looking stick. Click the link above for pictures. This page is for my dream machine. Currently my dream machine is nothing more than a twinkle in my eye and a keyboard splitter circuit courtesy of Stephan Hans. As my project progresses I'll document it here. For now though I'll put down the little I've actually done, and what I intend to do. We'll see how it actually turns out. 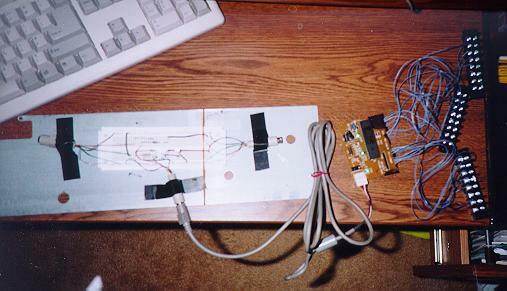 I plan to use a keyboard interface from a hacked apart keyboard as my main controller. I will use the keyboard splitter from Stephan Hans to enable dual arcade control / keyboard input. I will use either Stephan's serial port splitter or a commercial splitter from Why-mouse to hook both a spinner and a trackball to the serial port. I will use a normal PS/2 mouse in the PS/2 port. I may also build one of the adapters to allow hooking up Nintendo/Super Nintendo/etc control pads to the joystick port, and may use Stephan's joystick port splitter circuit to have multiple pads. I'm going to purchase / steal / beg an arcade cabinet from somewhere, gut it, and mount everything to that. I'm thinking of putting in a keyboard tray above the coin slots, so that I can pull the keyboard out when I need it instead of having it buried in the back/side somewhere. I'm going to use Paul Reid's ArcadeEmu front end for most of the games on the system, as it supports a mouse. This will let me pretty much use the trackball to move the cursor and pick the games instead of fumbling for the mouse or keyboard. As discussed on the main page, I will be using a hacked apart keyboard as my primary source of input to wire my buttons and other controls to. I've dismantled a Gateway 2000 keyboard (one that was going to be thrown away at work). Inside the keyboard shell, there was a metal plate going the length of the keyboard. Resting on top of this was a piece of flimsy with circuits traced on it. Resting atop the flimsy were rubber plungers that, when pushed down, make contact on the flimsy and complete the circuit for whatever key was pressed. The top left of the flimsy is where all the circuit traces on it terminated in a parallel set of contact points. Sitting beneath the flimsy at this point is a 2" by 3" circuit board, with a set of copper contacts aligning with the contact points on the flimsy. Really horrible picture here (I will try to get better pictures soon). On the circuit board is the keyboard controller chip that handles all the logic and communicating with the PC (on the other side of the board from the picture). This is a fairly standard design. Since all the logic and communicating with the PC is done from the 2" by 3" circuit board, that's all I need from the keyboard for my system. The rest of the keyboard is just the mechanical part - and that's what I will be replacing with my own arcade buttons and controls. If you take a good look at the horrible picture that I'm replacing soon of the circuit board, you'll see a line of silver solder points about midway down the board, parallel to the copper contacts at the bottom. Each copper contact leads directly to one of these solder points. These solder points then lead to the keyboard controller chip. To interface my custom controls to the circuit board, I will solder wires from the solder points on the board to a set of quick connect terminal blocks (purchased from Radio Shack for a few bucks). See the picture here - note, this shows the other side of the circuit board, with the solder points down. I could solder wires direct from my arcade controls to the keyboard circuit board, but what if I wanted to change the layout later, or if I wanted two buttons for the same control (left and right handed fire buttons for instance)? I'd either have to unsolder and resolder or have multiple wires to the same solder point, etc. Very messy. Using quick connect blocks, I can redesign the controls without touching a soldering iron again. Highly recommended. The next step is to map out the keyboard matrix. Connecting a wire from one contact to another contact on the circuit board is what generates a signal to the keyboard controller chip, which then generates a key to send to the computer. A simple matter of experimentation soon led me to having it mapped out. On my keyboard circuit board, there were 16 contacts on the left, and 8 on the right. Connecting a point from the left to one on the right generated a keypress. Connecting two points on the left, or two on the right, generated nothing. This let me map out a grid of 16 by 8 and then fill in the various keys produced by connecting contact points. I took a piece of wire, and soldered an aligator clip to it. I then clamped it to the first of the 16 contact points, and then one at a time, touched it to each of the 8 right hand contact points to see what happened. It looked like this. Notice the re-attached keyboard cable. I started my computer with the non-hacked keyboard, then unplugged it, and plugged in the circuit board to test with. 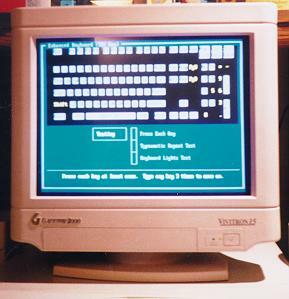 Because not every keystroke produces a visible effect, you will need some kind of keyboard testing program. When it detects a keypress it flashes it on the screen. Mine was a commercial package we use at work, but there is a free one made by David available for download here. Finally, once I had the circuit board soldered to the quick connect blocks, and had the keyboard matrix mapped out, I put together a "beta" control system. I built Stephan Hans' keyboard splitter circuit on a breadboard from Radioshack. I attached the keyboard cable from the circuit board to one of the inputs on the keyboard splitter, attached a full keyboard to the other input, and ran an extension cable from the splitter output to the computer. Fired the whole thing up, and verified that the full keyboard worked, and that by connecting wires on the quick connect blocks I was also able to produce keyboard signals. The whole thing is mounted on a piece of wood until I know how I'm going to build my final project. Hopefully, from this to actually wiring buttons to the quick connect blocks should be a no brainer. Picture. One thing I haven't tested so far is the ghosting thing - I'm seriously debating scrapping the hacked keyboard idea and going with a keyboard encoding chip from Hagstrom electronics (see main page), just to avoid this problem. Stay tuned . . .